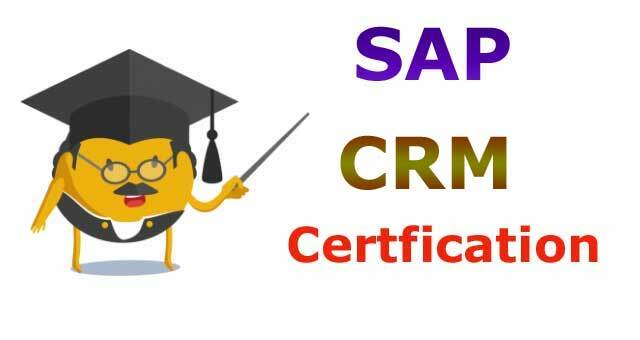 A well designed SAP CRM course incorporates many modules connected with customer relationship management and covers areas in e-commerce, marketing, middleware, sales, analytics and customer services. SAP CRM (Customer Relationship Management) courses are designed to deliver mastery level instructions that help candidates use the components of the module with accuracy and ease. Those interested in these training sessions should possess a zeal for excellence and hard work and a willingness to learn new things. In addition, they should have good communication skills and the right team spirit too. CRM basic data & customization settings for business partners and so forth. The duration of the SAP CRM course may vary from 5 to 40 days and the fees are based on the methodologies of specific institutes. SAP CRM training covers a variety of subjects which imparts skills and knowledge of customer relationship management and includes topics such as analytics, sales, e-Commerce, marketing, Middleware, sales, and Customer services. The duration of the course could vary from 5 days to 40 days and is totally based on the institute and candidates proficiency. Firstly, fantastic work that you are carrying on in the forum. Secondly, I would appreciate if you could advise me my next step. I have close 10+ years of experience in Sales, Business Development , Key Account Management, Brand Management, Public Relations Development, Marketing, Market R&D, Client Servicing so on and so forth in various different verticals and currently working as a Sr.Business Manager. I come from a technical academics background. I did (BCA+PGDBA), SAP ERP is where I want to be now as I am not fixed on any domain, I am looking forward to get into SAP CRM training (Functional) and start a fresh career into SAP. a) With 10+ years of business Development experience and completing SAP CRM module, will this enhance my career ,though I might have to start from scratch, but on the longer how does the stand look like with my profile? b) What would be the combination module along with SAP CRM that I can focus in the future (SD/MM/SEM/BP/PLM/SRM/SEM/QM/CS/IS/EP) etc? This is a very calculative move I would like to make and it would help in decision making with your valuable advise. Also if you can guide me with some honest and good training centres in Pune from where i can enroll for this certification. I look forward to hearing from you as early as possible. I am looking for SAP CRM Technical and Functional Training as regular class training if it is avaialble in Bangalore. could you pls suggest any available. I've completed my M.E in Computer Engineering.I am working as a quality analyst.Can I change my career to SAP QM?